INJM Working on a landslide-relief project in Onagawa town. This is one of the groups in Tohoku that has playedgracious host to Foreign Volunteers Japan members on several visits up to Tohoku so far. The group was originallyformed in the famous “Tent City” in Ishinomaki, that ran frommid-March until September 30th, on the grounds of Senshu University inIshinomaki. The founder of the group, Jamie El-Banna, is known as thego-to-guy for information regarding local conditions in Ishinomaki. He has workedclosely on projects with the British Chamber of Commerce, Ishinomaki 2.0,Samaritan’s Purse, and several others. Jamie (far right) welcoming a new group of volunteers to INJM HQ. While working in Osaka, Jamie travelled out toHigashi-Matsushima on a volunteer trip in mid May. Although that was well afterthe initial rescue phase of the tsunami relief efforts, the level ofdevastation and unmet needs of the refugees that Jamie encountered, made himrealize that there was still tremendous amounts of work that had to be done forthe relief efforts. After returning to Osaka, he didn’t feel right settlingback down in the city. There was still so much to be done in thetsunami-affected regions. After a few weeks, he made the dramatic decision toquit his job, sublet his apartment, and moved out to Tent City in Ishinomaki. Thatwas where the core organizational group behind the It’s Not Just Mud projectwas formed. Long-term volunteer Manish already muddy by 10:00am. The name for the project of course, comes from theinitial challenge facing anyone getting involved with post-tsunami clean-up andrelief work. Not only did the devastating force of the tsunami destroy much of what it came into contact with, it also covered nearly everythingelse with a thick layer of toxic, bacteria-breeding, noxious and thick mud. Although theearly days of the project revolved around clean-up projects coordinated throughlocal volunteer centers, INJM has since expanded their projects. As of the endof September, the It’s Not Just Mud project has now moved into two neighboringhouses in the Watanoha district of Ishinomaki. Impressed by their volunteeractivities, the houses were actually offered to the group by refugees who had beenable to move to another district of the city. When the groupfirst moved in, the first floor of both houses were hollowed-out. The walls andfloors had been badly damaged, festering sludge under the floors, and rottinginsulation in the walls all needed to be extracted, and shattered windowsneeded to be boarded up. Over the lasttwo months, Jamie’s group has worked on-top of their other volunteer projectsto restore the house to working shape. By the end of September they hadfloorboards and walls extracted, and removed the tsunami sludge. Soon afterthat they put up new walls and floorboards (generously provided by Samaritan’sPurse), as well as restoring the water and gas. By early October they replaced theelectrical sockets, and soon will have a water heater installed. Even withoutthe water heater, Jamie explained that volunteers are able to visit the localtemporary hot-springs facilities for a hot bath. Knocking down a wall on a recent project. Encouraging volunteering – They do this by offering assistance in coming in terms of advice and logistical support. Salvaging homes in the Ishinomaki area – In many cases, only the ground floor of the home was flooded, and in some cases soaked in sea water for up to three days. Months later, the building materials are waterlogged and rotting, and must be removed. This means removing the walls, ceiling, insulation, and flooring, then the 3-5cm layer of mud that is under everything. Normally, this kind of work would be undertaken by a professional builder, but because of the enormous number of damaged homes, the waiting list to get a professional builder is extremely long, and the process is costly. They work with experienced volunteers (several of which are trained builders) to perform this manual labor and gut houses, taking them one step closer to being liveable. For some families, they have been living on the second floor of their damaged home for months, passing through the rotting and hazardous first floor daily. Making it safe and clean is a significant improvement for these people. 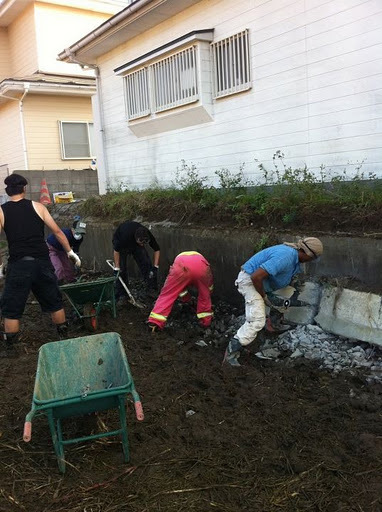 Salvaging homes further afield – INJM work with both local groups in central Ishinomaki and in more remote areas of the region. They have identified the need for this kind of service in towns across the Oshika Peninsula. Delivering fresh fruit and vegetables to areas that don’t have accessto such things. Now that the Winter is coming, INJM has begun focusing on thedistribution of Winter coats, kerosene heaters, and running a ‘kerosene pickupand delivery service’ for residents of refugee shelters and temporary housingunits without access to a car. INJM volunteers helping a local sake-shop owner restore her business. Below you can find some of the most common reasons peopleuse to not come. They all have a valid basis, but after reading below, I thinkyou’ll find that in actual fact, there’s nothing to worry about! I’mworried I’ll find something really scary in the rubble!! The Self Defense Force has cleared most of the largedebris in Ishinomaki. Most of the work we do is clearing mud that is 2-4cmthick from homes and properties. You might find something that is emotionallytroubling, for example people’s personal belongings or photographs, but it isunlikely you’ll find something truly troubling with the kind of work we do. Everyonehas to start somewhere! You will always have someone experienced working withyou who can answer your questions and tell you what to do and how to do it.It’s not too difficult, and after a day you’ll quickly learn what needs to bedone, and will be able to teach new volunteers yourself. Youwon’t be asked to do anything you can’t do. Some jobs do require strength, butif you aren’t cut out for that, there are plenty of things you can do. Plentyof women and older people work with us! Allthe professional building equipment will be provided. Please look here for what you shouldbring! I can’tbook a bus, I don’t read Kanji!! Contactus with your dates and we can arrange someone to do that for you. That’sOK! On the work site we will always make sure you understand what you’resupposed to be doing, and there are plenty of people around who can help out ifyou don’t understand.